Happy birthday to my big brother! And to my nephews tomorrow. Today I was thinking about how this day 11 year ago I took my sister in law to the doctor, she got told she was staying to have babies! So I left to get my brother (in their car, she was too big to drive, ha!). OH MY GOSH!! And then I went home and got sick! Then last year we were sick. Now this year we're sick! This is not a good date for us. Okay, that went off track. Oh, I also remember making lasagne and cheesecake for the first time for AJ to eat at the hospital. Then I got sick. Hmmm...then I think they got sick. I can't remember, but this is becoming more of a confession than I intended. Anyway, HAPPY BIRTHDAY AJ! And, we're sick. I went down Tuesday. I've had food poisoning, the stomach flu, colds, migraines, pneumonia, vertigo - but this is the first time I haven't been able to take care of my kids. Husband stayed home for two days while I died in bed. I could feel every bone and crevice in my head - my teeth hurt, my hips hurt. It was not great. I was at the pinnacle of terrible last night and I couldn't manage to brush my teeth - today I work up with a cracked lip and brown blood covering my teeth. So hot. Today I'm feeling a little better - my fever is down and I'm on the mend. Then Wade went down this afternoon (he threw up too, poor kiddo!). Husband is waiting to go down, he's hoping he makes it to the weekend and can die without missing more work. I'm going to be sappy for a second - I'm so grateful that Husband was able to stay home! I loved listening to everyone laugh and giggle with him. He got everyone out of the house, kept everyone fed, had to change 8 poopy diapers in one day - he even pulled the mattress out of the spare room so I could watch TV in the basement. Did he feed my dog?! I better go check that my dog has food. Oh, and he did throw meds at me cause he didn't want to touch me. Ha, but we're all going down. We went to a super bowl party on Sunday - ugh, I'm thinking of everyone we potentially infected. Course pretty sure we got it from one of the families. Ha, in a group of friends, it's inevitable! Lamest party about that is that they had it all of last week and now we have it all of this week. Shoot, this paragraph is turning out to be able sickness too. Jac discovered that the strings on my jacket made great make up brushes. This girl is all about the make up! 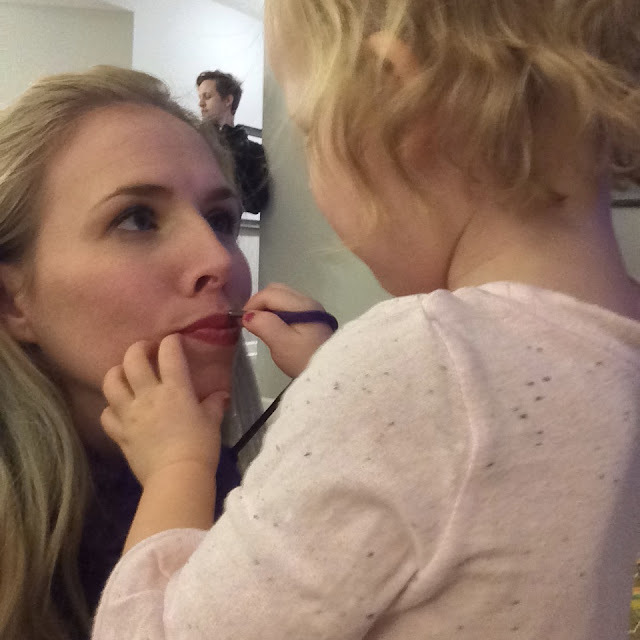 I have to put gloss on her several times a day and every time I put on make up she has to touch my whole face and tell me all about it! But then there's this girl, she just goes for it! Nothing like messing up my nice brushes with my more expensive concealer. These girls have been going non-stop. They've been mischief and mayhem ninjas. Blake got that make up on her face while I was standing right next to her. But then I turne on the Trolls show (not the movie, they made a low budget Netflix series that we've watched far too many times) and they dropped like flies. Only works when they're exhausted for nap time. Wade's been reading to the girls. Well, really I take to long to read the words on the page, so he takes over and tell his sisters all about it. We read the truck books over and over, and just got a book from eh library about messes. The kids knows what he likes. We also discovered a show in Amazon Prime called Stinky and Dirty about a garbage truck and backhoe - he thinks it's HILARIOUS! Okay, and now I'm going to pass out.